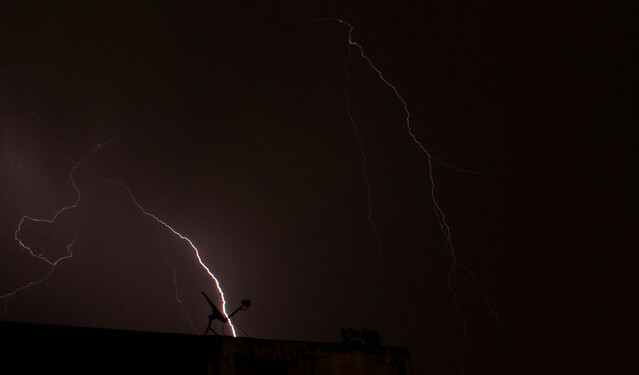 R Karthik Photography: Lightning Strikes!!! A few days earlier there was a thunder storm in Delhi and it was accompanied by lightning. This was an opportunity that does not come very often and so I decided to take a photograph of this beautiful natural wonder. A word of caution. Lightning is dangerous and you can die if it strikes you.When ever you do decide to photograph one please make sure you are at a safe distance from this natural phenomenon. If you have ever tried to photograph lightning by clicking when the lightning struck would have realized how futile it is to try and capture the lightning. For this you need a bit of planning, yes planning. First you need a tripod, a camera which can go into bulb mode and a remote cable release. It would be handy if you had a ND filter but it is not necessary. Next you need to see where the lightning is coming make sure you are not in its path. Put the camera on a the tripod, pre focus the lens. Set the ISO to 100 or 50 if your camera allows you to go that low. Close the aperture anywhere between F18-f36 depending on your lens. Take the remote cable and leave the shutter open and then wait for lightning to strike. Once it does close the shutter voilà you have it. So the next time you have rain with lightning and you are in a safe place do give this a try.